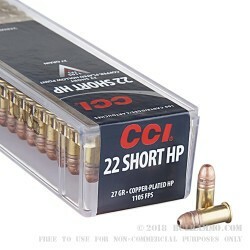 Upsize your order with this 5000-round case of .22 Shorts, and you'll have consistent zero that you can trust for many range sessions, camping trips, and squirrel hunts to come. 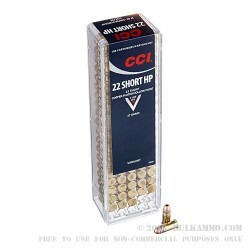 CCI's ammo is manufactured in Idaho using factory-rolled brass casings, clean-burning propellant, and industry-famous primer mixtures that expel zero corrosive elements. This configuration is topped off with a copper-plated hollow point (CPHP) bullet with an ample bourrelet that makes sufficient contact with barrel rifling; this contributes to proper stabilization for great accuracy out to typical rimfire distances. Copper plating reduces lead fouling while a skinny narrow cavity offers dependable expansion upon impact with a game animal. A high-velocity powder charger ensures penetration that is deep for the caliber, even when fired some tiny, belt-buckle sized revolvers. When the bullet expands in a target, it creates a larger wound cavity and efficiently transfers squirrel-dropping energy to the target. 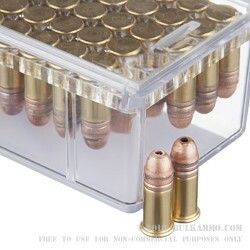 Each 100-round box in this case has a sliding lid that allows you to grab as many or as few as you need and can be reloaded as necessary.